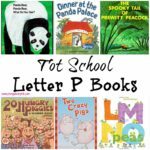 This post, Letter M is for Mouse and Monster Craft, may contain affiliate links. This means if you make a purchase through one of these links, Penguins in Pink will receive a commission at no additional cost to you. 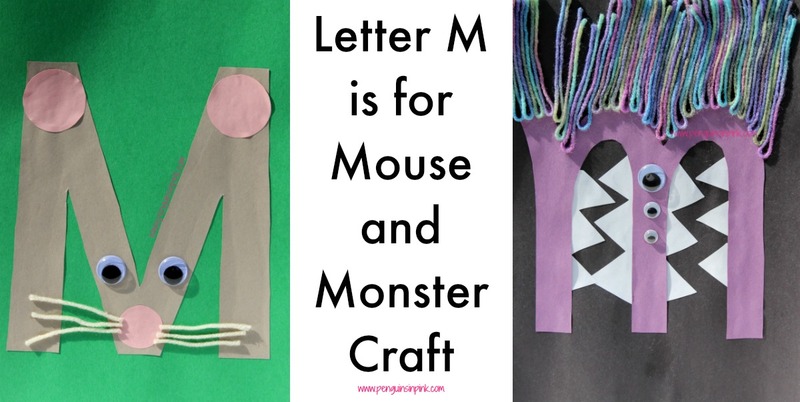 To help Cakey and Doodles learn the letter M we made Letter M is for Mouse and Monster Craft. I really like these kinds of crafts because they help both girls not only learn the letter and something that starts with that letter but the craft allows them to work on learning to use glue neatly. Neatly being the key word. While Cakey is able to use glue by herself she is not always very neat and Doodles is still learning. The first time Cakey and I did these crafts was in 2014. We are now on our second time going through them (Doodles is on her first time). You can see in the photos at the end a comparison of Cakey’s first time and her second and also Doodles first time. I am hoping to add additional photos when we do our Letter M is for Mouse and Monster Craft again next year. The first time we made this craft I free handed the additional pieces and cut them out from scrap construction paper. This time I created the images and printed them out. 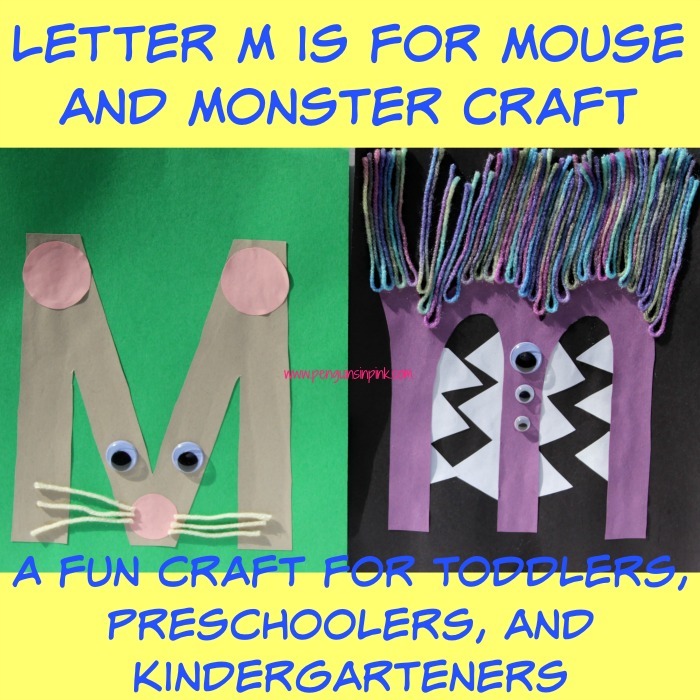 You can find the printables for free here Letter M Mouse Monster via Dropbox. In this file you will find a large capital M, a lowercase m, and 1 page with ears and nose for the mouse, and 1 page with whiskers, eyes, and teeth. 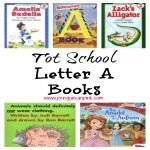 While the girls were working on their letter “M” crafts, I read Mice are Nice from our Tot School Letter M Books list. Print the large capital M on white, grey, brown, black, or tan construction paper. Cut out the capital M.
Print out page 4 on pink construction paper and cut out the ears and nose pieces. Print out page 5 on white construction paper and cut out the whiskers and eye pieces. Or use the yarn and googly eyes. With your help, have your child glue the M to a sheet of construction paper. Glue the ears and nose pieces to the Letter M Mouse. 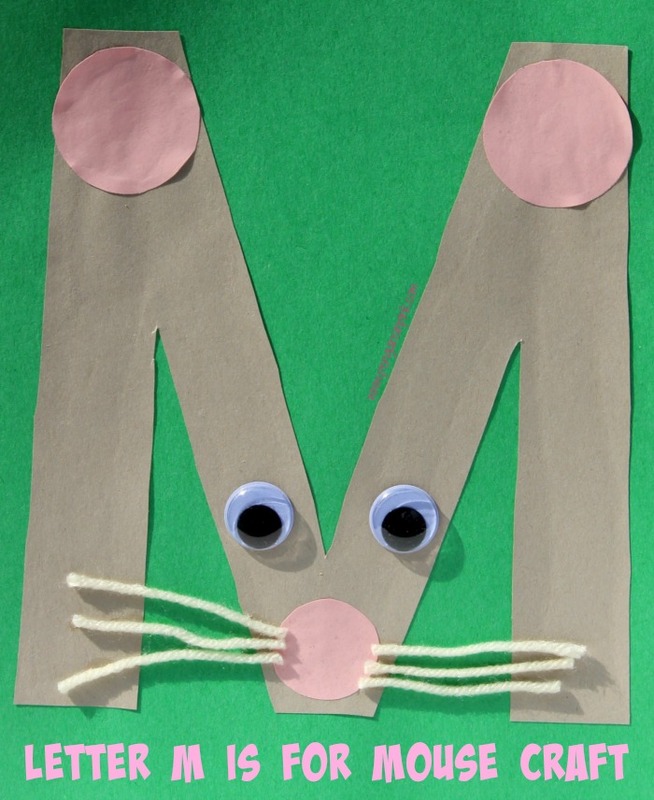 Glue the cut out eyes and whiskers on or use googly eyes and yarn for whiskers to the Letter M Mouse. 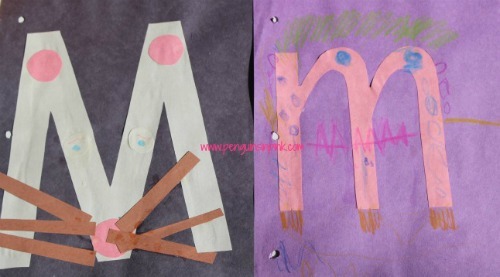 Print the large lower case m on any color construction paper. 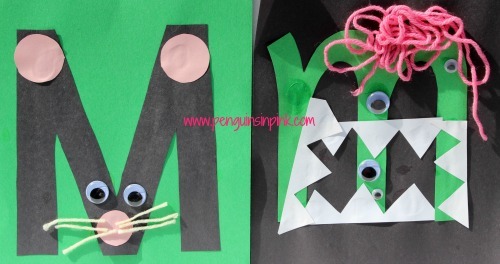 Cut out the lowercase m.
Print out page 5 on white construction paper and cut out the eyes and teeth. Or use googly eyes. Glue the teeth and eyes on the Letter m monster. Or use googly eyes. 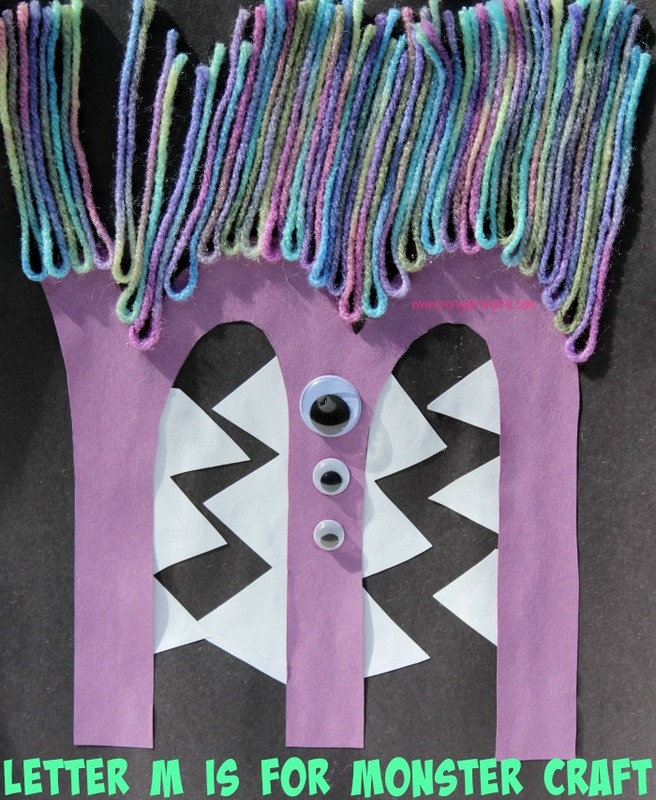 Use the yarn to add hair to the monster. 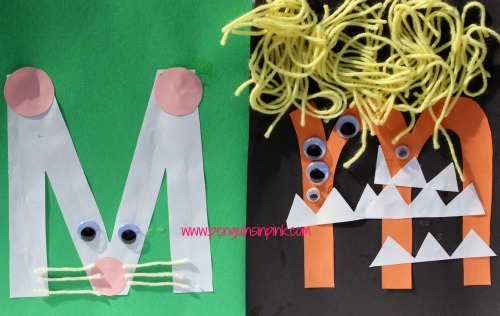 Have you and your kids ever made a Letter M is for craft? 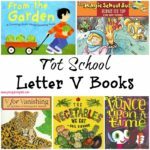 What animal, food, or plant did you make for the letter M?